Zoll AutoPulse Committee Presentation (17of17).jpg – Huron County Paramedics, Adam Robinson and Cassie Crawford, demonstrate how the Zoll Medical AutoPulse Resuscitation System works. Goderich, Ontario: A new lifesaving device and new technology are helping Huron County Paramedic Service (HCPS) battle the health crisis of sudden cardiac arrest (SCA). 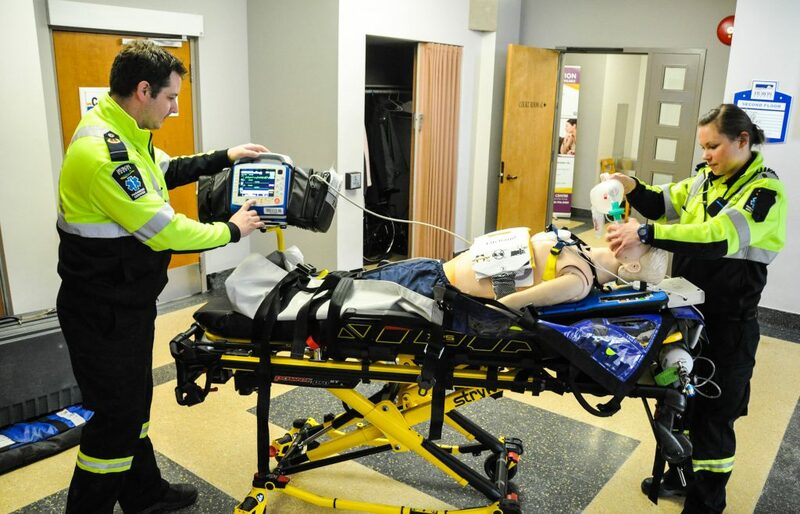 In addition to equipping its ambulances with a high-quality, automated CPR Device, to help Huron County paramedics treat SCA, they have implemented a therapy called Shock Sync™. Huron County is one of the first in Canada to make the use of this technology mandatory on all SCA patients. 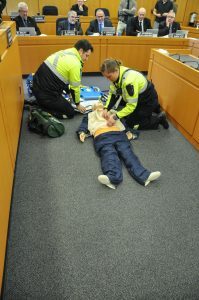 The County of Huron has invested in 13 AutoPulse® Resuscitation Systems with ShockSync from ZOLL Medical Corporation, allowing all ambulances and rapid response units in Huron County to respond with this life saving equipment. The AutoPulse helps to improve blood flow to the heart and brain during sudden cardiac arrest because of the unique, high-quality chest compressions it generates. In addition to this, the Shock Sync therapy will automatically synchronize a shock from the ZOLL X Series at the most optimal time to a patient while receiving compressions on an AutoPulse. Huron County’s Paramedic Services delivers emergency pre-hospital medical care to all residents and visitors in Huron County for life-threatening medical emergencies and transportation of sick or injured patients. Eight front-line ambulances and one Rapid Response Unit work each shift. These vehicles are strategically located to help reduce response time to an emergency. With the new Province of Ontario Performance Measures, it is important to attempt to meet the 8-minute response time established by the Ministry of Health and Long-Term Care. For more information about ZOLL and its products, visit www.zoll.com. For more information on SCA, visit http://www.early-defib.org.